I do love the combination of lemon and cranberry. Last year I made these lemon and cranberry cookies which were delicious. I think it’s a combination that works really well. I’ve been wanting to make a Bundt cake for ages but didn’t have a tin. Every time I would go into TK Maxx I used to look at the tins and think shall I buy one? I resisted but decided to request one as a Christmas present. Luckily my Dad obliged and on Christmas day I opened not one but two lovely Bundt tins. One was a Savarin tin and the other was a fluted one which I used for this recipe. Before Christmas I picked up a packet of fresh cranberries and they sat in the fridge. They were well-traveled cranberries as they came all the way to Devon with me (sat in the fridge in Devon) and then traveled back to Hampshire before being used. 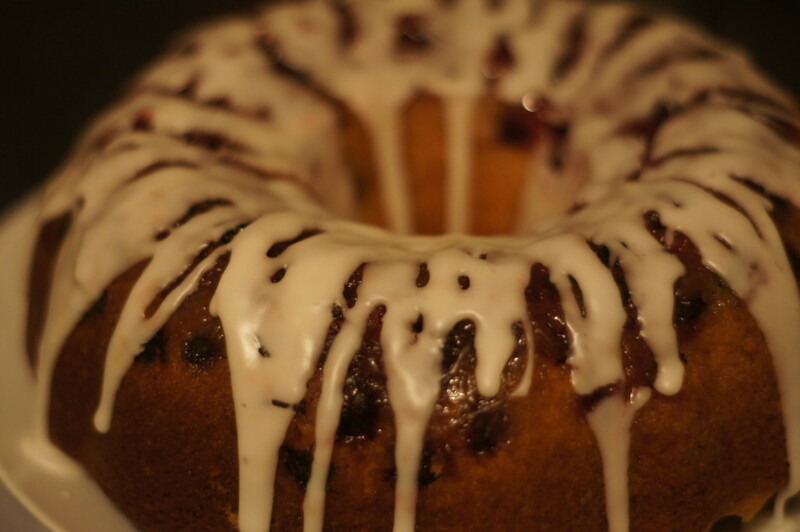 I decided that a cranberry Bundt would be a good way to use these poor cranberries (which were beginning to look a little but past their best). I found quite a few different recipes (which I have collected together on my snazzily titled ‘All about that bundt…‘ Pinterest board) using fresh cranberries but as I had some lemons that needed using (as explained in my Lemon drizzle loaf post) I decided that this was the recipe to go for. I think one of the best things about a Bundt is that they look so visually interesting due to their shape. They’re a little bit different. Stick a bit of icing or glaze on top and they look even better. I’m pretty pleased with how this turned out for a first attempt and I’m looking forward to trying out some more in the near future. This is an American recipe so uses cups. I converted some of the measurements so used a combination of weighed ingredients and cups – this didn’t seem to affect the end result. The recipe states that you will need a 12 cup Bundt tin. My tin is a 25cm one from Lakeland – it fitted perfectly. You will need quite a few bowls for making this recipe. 1) Preheat your oven to 180C/350°F/Gas 4. Generously grease your Bundt pan with butter. 2) Sprinkle the brown sugar in the bottom of the pan, then evenly distribute the cranberries over the sugar. 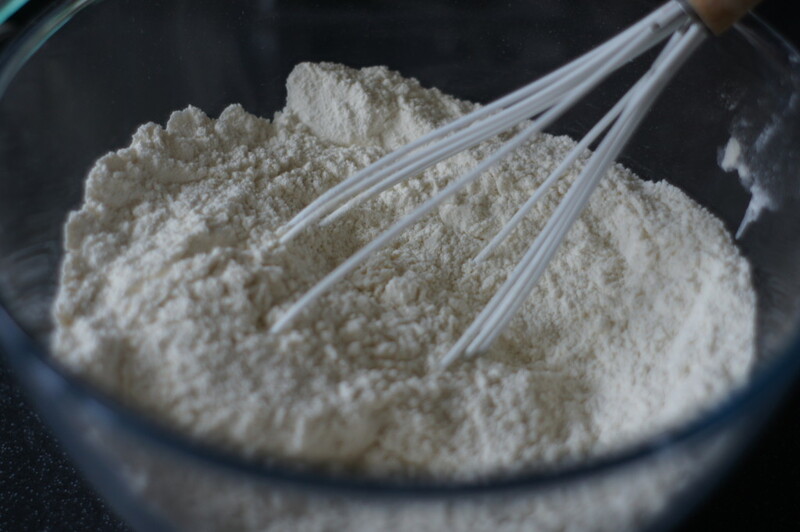 3) In a bowl, whisk together the flour, baking powder, baking soda and salt. 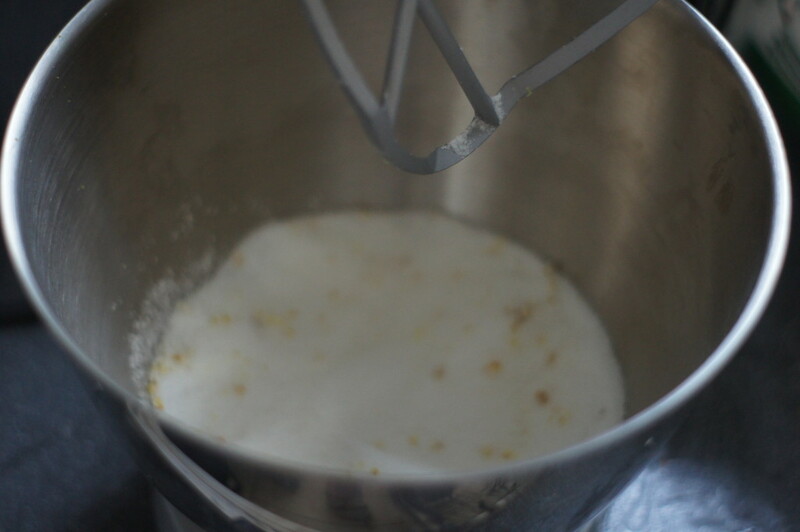 4) Add the granulated sugar to the bowl of a stand mixer. Finely grate the zest from the lemons over the sugar and mix briefly. 5) Squeeze the juice from the lemons. In a jug or bowl, combine 2 tablespoons of the lemon juice, the buttermilk and vanilla. Reserve the remaining lemon juice for later (to make the glaze). 6) Add the butter to the lemon zest–sugar mixture and beat on medium-high speed until light and fluffy for 1 to 2 minutes. Beat in the eggs, 1 at a time, scraping the sides of the bowl after each addition. 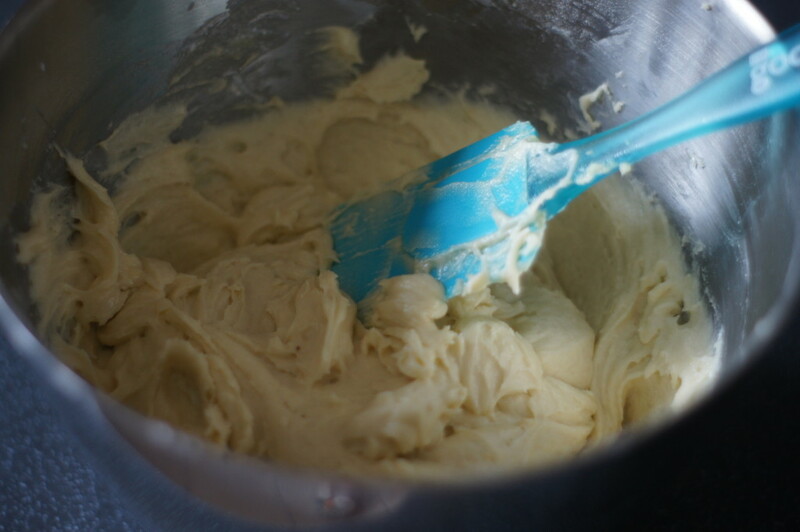 7) Reduce the mixer speed to low and add the dry ingredients in 3 batches, alternating with the buttermilk mixture in 2 batches. Raise the mixer speed to medium-high and beat for 2 minutes to aerate. 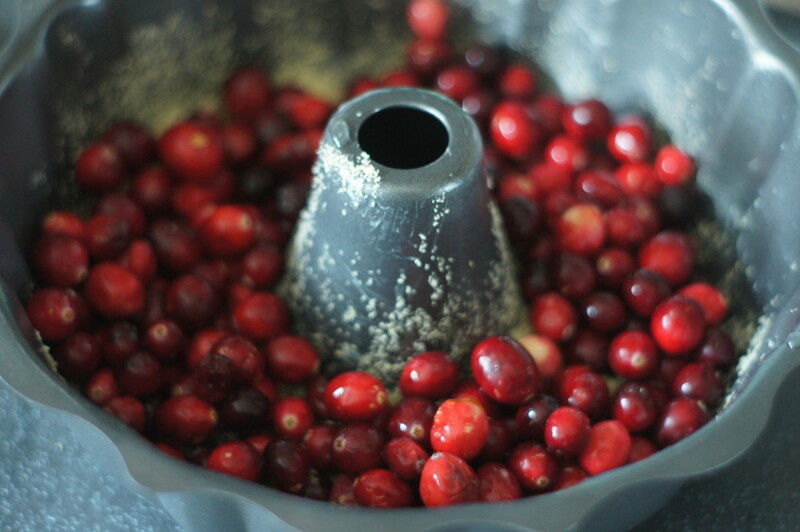 8) Scrape the batter into the prepared pan and spread it evenly over the cranberries. Bake until the cake is browned and a cake tester inserted into the centre comes out clean, 35 to 40 minutes (Mine took nearer to 50 minutes). Let the cake cool in the pan for 5 minutes, then invert the cake onto a cake plate, lift off the pan and let cool completely. 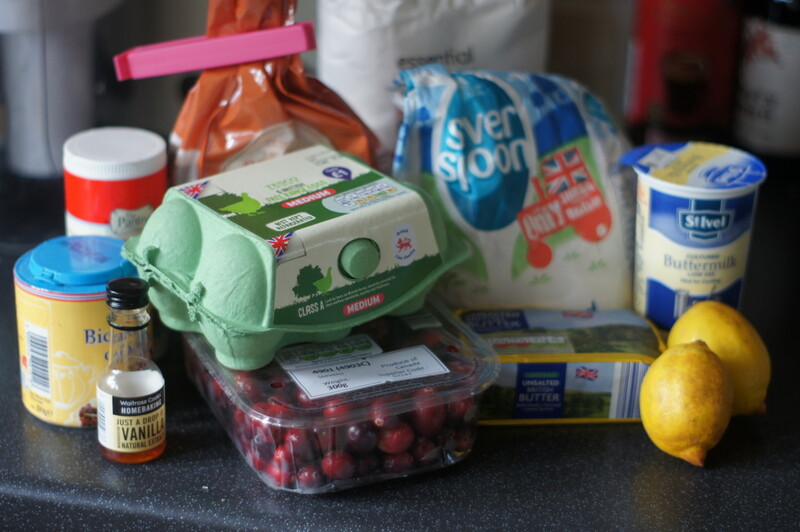 9) Once the cake is cool, in a bowl, whisk together the icing sugar and 1 1/2 tablespoons of the reserved lemon juice until thick and smooth. Test the consistency by drizzling a bit of glaze over the cake. If it runs off the cake, whisk in a little more icing sugar; if it sits on the cake without moving, whisk in a little more lemon juice. Drizzle the glaze over the cake and let set for at least 15 minutes.